March is the turn of the Red Ribbons to set the house challenge and we hope that lots of you will join in. We look forward to seeing your layouts. Last edited by scrapdolly; 29-07-2015 at 06:27 PM. For 10 points please use the sketch. For 10 points please do an altered background - you can use mists, inks, stencils, gesso, anything, as long as your background paper is altered!! For 10 points please include some hand written journaling. Have fun with this, really looking forward to seeing what you all come up with! It doesn't have to be a replica of the layout.. I just want you to take at least three elements of it and include it in your LO. You will see there are lots of things to choose from, stamping, stars, circles, chevrons, numbers, banners, torn PP's, hearts, vellum, grids, masks, washi, etc, etc. Choose any three for 10 points. Secondly, as many of you know, I recently became a Granny so I would like you to use the theme of 'New Beginnings' for your photo for a further 10 points. Lastly, because I have a baby grand daughter, I would like you to use pink somewhere in your LO for the final 10 points. Welcome to The Classy Crafter's team challenge, I hope you enjoy it. As we hardly ever scrap ourselves, the first part of our challenge is exactly that - to scrap a photo of yourself at any stage in your life. We would also like you to include an interactive element to your page. This can be a flap to cover journalling or for more photos, a tag that needs to be pulled out or anything else that you can think of. Finally we would like you to use that bit of paper you have been saving for something special or those brads/eyelets you haven't used in a while, those paper flowers you bought by the jar when they were in vogue or anything else that you have had in your stash for a long time just waiting for till you found the perfect page to use it on. and thirdly, I have been a bit of a sticker collector over the years - alphas, plus LOTS MORE !! Last edited by scrapdolly; 29-07-2015 at 06:33 PM. Welcome to my first solo challenge despite being a member of UKS for many years; I hope you enjoy it! May the 4th is a Bank holiday in the UK, so I thought scrapbooking some holiday photos would fit the bill. To make life easy for you, by holiday I mean any holiday at any time of the year, so if you have summer, Christmas or Bank holiday photos in your pile waiting to be scrapped, now is your chance. I was lucky to travel to Spain for two city breaks over the Easter holiday just gone, as I celebrated my Silver Wedding Anniversary...with my husband too of course! Naturally I took a huge number of photos, so in an effort to get them scrapped I am making as many multi-photo layouts as possible. So could you make a muliti-photo page please, with a minimum of 3 photos? 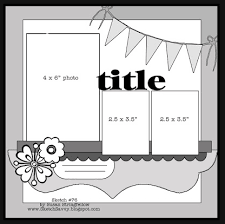 Finally, I know fashions come and go in scrapbooking, but one that just hasn't waned for me is the use of Kraft, so can you use Kraft somewhere on your page? Easy scoring this week, 10 points per category met. Good morning scrappers, I’m really pleased to have the opportunity to set another solo challenge for you this week. I’ve noticed recently that the photographs I’m scrapping are beginning to feature places and things that have caught my eye either on vacation or out and about here in Normandy, so I’ve made that the main focus of this challenge. For 10 points use a photograph (s) that focuses on an object. Choose something like a building; statue; piece of art. A book; door; window; tree; plant; flower or even food! People or animals can be in the photo, if you want, but the star of the LO should be the “thing”. For 5 points include something black and white on the page. 5 more points for including a cluster of embellishments, or one large embellie, somewhere on the LO. 5 points for using white cardstock as the back ground. Finally, use a one word title for the remaining 5 points. Some of our team attended a local crop recently run by the Scrap cafe, they were challenged to create a LO based on their favorite movie poster, the results were fabulous, so we decided to spread this challenge to UKS. You have a free choice of movie posters for our challenge, but for those who don't want to surf the internet, here are some movie posters that our team like and think could inspire you (just tell us which one you have used), or use the link above to see some of the most iconic movie posters. Have a browse and tell us which poster you have used. Hello, I'm new2this and this is my second solo challenge .. Welcome. I was looking back at my old LOs and found a few that used a grid as a guide ... so I thought I would use one for this challenge. This is the one I chose .. Please use the grid - either as itself or as a sketch/guide - and at least 2 photographs .. 10 points. For another 10 points use either all cool colours or all warm colours - I am never sure which palette I like best, hence the choice! For the last 10 points, use a mixture of patterned papers and plain to fill all or some of the grid openings -- a 2>1 ratio would be nice. 3) Use patterned/plain papers (2>1) = 10pts. Last edited by scrapdolly; 29-07-2015 at 06:40 PM. I am hopeless at scrapbooking so I need to follow a sketch - please use the one shown below. As June is a Gemini month - please use 2 (or more) photos - the 2 smaller photos on the sketch can be just one larger pic if you wish. Also - in USA (where else) June 15th is National Lobster Day !! so please use some red on your LO and also something to do with the sea/water.